The awesome Jes DeGroot is back with a new weekly post! If you missed her first post about Theatrical Improvisation, (where I also give you a little background on her awesomeness) Click Here. 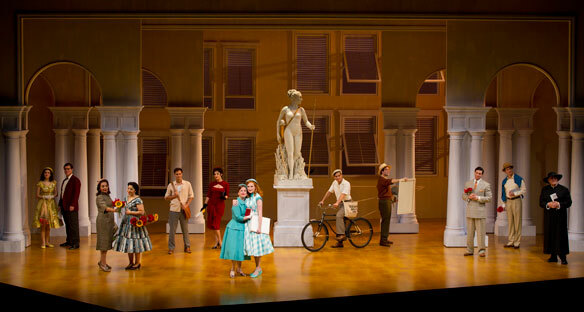 Today, she shares with us a review of Light in the Piazza at South Coast Repertory. It was really interesting for me to read this review from the eyes of a teen. I recommended this show because the music style is right up her alley. While this is one of my favorite shows (I saw it 3 times on Broadway) I know it's not really a show for everyone. (Especially most younger Musical Theatre Lovers). I loved hearing what Jes took from it and how it was seen through the eye of a teen. Enjoy! And… if you'd like to see this beautiful show. It runs this weekend – click here for tickets. 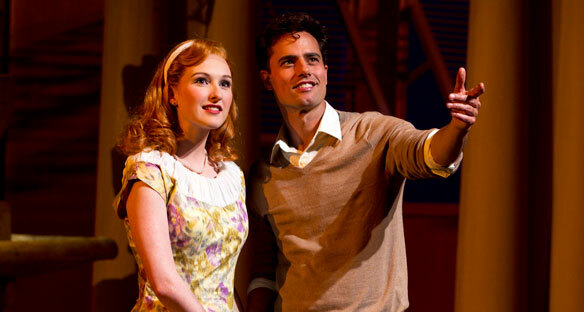 Last week I attended the six-time Tony-award winning musical The Light in the Piazza. It was my first live theatre production of 2014! It’s the story of an American mother and daughter who are vacationing in Italy when a young Italian man named Fabrizzio falls head-over-heels for young Clara. The production, put on by South Coast Repertory and directed by Kent Nicholson, had a fairly small, but talented cast. It starred Patti Cohenour as Margaret (Clara’s mother), Erin Mackey as Clara, and David Burnham as Fabrizzio. The orchestra played beautifully behind shuttered windows on the stage and served as part of the simplistic set, which allowed the actors themselves to shine. Costumes were gorgeous, and thoughtfully put together. The performances of Burnham as Fabrizzio and of Melina Kalomas as Franca (the wife of Fabrizzio’s brother), particularly stood out to me. They both added an unexpected humor to their roles, and stayed COMPLETELY IN CHARACTER THE ENTIRE TIME! Not even for a second did they have me not believing that they were Italian. “Il Mondo Era Vuoto” by Burnham and “The Joy You Feel” by Kalomas, were exceptional performances—I LOVED them both! And I want to give a special kudos to Mackey for her vocal performances of “The Light in the Piazza” and “The Beauty Is.” Her voice is gorgeously pure and it was a delight to listen to her. However, there was just something in the rest of her performance that kept me thinking I was watching Galinda from Wicked—that popular girl just kept slipping out. The Light in the Piazza definitely has a very deep storyline, more than I am accustomed to watching. I don’t really think it is intended for a younger audience like me. It dealt with the subject of adultery, had some of the actors smoking on stage, and had one scene at the end of Act 1 where I diverted my eyes for a couple minutes (it made me VERY uncomfortable to be sitting so close to the stage with the actors being so intimate). Although I did enjoy the performances, music, costumes, and sets, I cannot say that I recommend the show for someone my age for the three reasons stated above, at least coming from this young teen. BUT, just to give you a little perspective, when it was over, I did hear a number of people who were much older than me commenting on how much they enjoyed the show. Thoughtfully critiqued! Since I am one of those older viewers, this review makes me want to go see it! Thank you! Thank you so much and thanks also for stopping by! I also love her thoughtfulness! I hope you are able to see this production. This breathtaking piece is not done very often. If you are able to see it, let us know what you think.